Showering has never been so fun. Moxie lets you stream your favorite music, news or talk radio right in the shower with you. The Moxie rainhead holds a portable speaker that pairs wirelessly with devices enabled with BLUETOOTH(R) technology to deliver high-quality audio to your shower. The speaker docks directly into the rainhead, so your music is closer than ever when showering. While it plays your favorite sounds, this rainhead uses air-induction spray technology to deliver a luxurious and drenching "rain" experience. Moxie is easy to install and use; the wireless speaker pops out for recharging, then securely pops back in for use while showering. You can even take it with you as a wireless speaker to use in any room of the house, or on the go. This completely wireless and weatherproof AudioRock is a perfect add-on to your e2 LightSpeaker System. Powered by a re-chargeable lithium ion battery and with its own volume control, you can enjoy up to 10 hours of sound on your deck, dock, patio or around your pool. Purchase additional AudioRock's to really rock out! You can connect up to 8 AudioRocks to your transmitter with the same ability as your eLightSpeaker's, to create 2 zones with 2 different sources supplying sound to each zone or all together. Deliver amazing sound to any room with the Google Home Max. Designed with advanced hardware, dual 4.5 inch woofers and 2 crystal-clear tweeters, this voice-activated device is built to deliver the ultimate high-fidelity audio to your living environment with a stylish profile. You can even stream your favourite music apps with Wi-Fi connectivity. The Homeguard HD 1080P Wireless Pan & Tilt Camera is a simple to use 1080P IP camera that can be conveniently positioned within the home (within wireless range of your internet router) and remotely controlled from your computer, tablet or Smartphone. It features great picture quality, capturing video in full HD1080P at 30 frames per second. It also includes a built-in microphone and speaker to allow you to listen and speak back to where the camera is located. The camera features a built-in microSD socket to capture video on (up to 128GB, not included). If you want a simple surveillance product to protect your home or a discreet way to monitor (and listen/speak to) children, elderly relatives or pets, wherever you are in the world, then this is the ideal solution for you. People are amazed at the Alexa voice command feature of Amazon Echo Dot. The AudDock can raise your satisfaction to the next level. Simply place Echo Dot into the top of AudDock and connect it with dedicated internal power and audio cables. You don't need to set up app, software, or driver. Now simply play with Echo Dot. Applying unique jAura Technology with digital amplifier of 7 band equalizer and 2 band dynamic range compressor will stream full range crisp sound with enriched bass via one dynamic speaker and two bass boosters. Working with built-in rechargeable battery, it makes your Echo Dot fully portable too. Bring your Echo Dot any place you want. AudDock will make it happen. 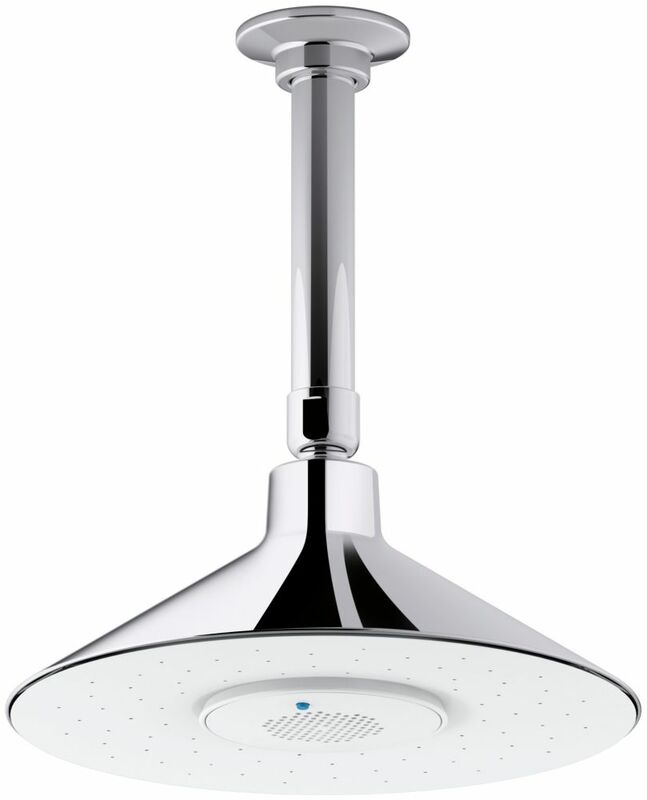 Moxie 2.5 Gpm Rainhead With Wireless Speaker, Polished Chrome Showering has never been so fun. Moxie lets you stream your favorite music, news or talk radio right in the shower with you. The Moxie rainhead holds a portable speaker that pairs wirelessly with devices enabled with BLUETOOTH(R) technology to deliver high-quality audio to your shower. The speaker docks directly into the rainhead, so your music is closer than ever when showering. While it plays your favorite sounds, this rainhead uses air-induction spray technology to deliver a luxurious and drenching "rain" experience. Moxie is easy to install and use; the wireless speaker pops out for recharging, then securely pops back in for use while showering. You can even take it with you as a wireless speaker to use in any room of the house, or on the go.